← New Post Day and Upcoming Topic! Welcome to my first post in the The Local Mash series which will highlight local Minnesota or Wisconsin breweries. My goal with this series of posts is to provide readers with some insight into the beers and the people brewing them in your local communities. The real joy of learning about craft beer is drinking the beers that are made in whatever area you are in. All parts of the world produce unique local goods, and beer is one that is experiencing a particular renaissance here in the United States. The craft beer market is growing at a rapid pace, and much of its growth is due to people drinking locally produced beers from their neighborhood breweries or brewpubs (for more, see this article). With that in mind, let me begin my tour of the local treasures available to us residing in the Twin Cities area with the Olvalde Farm and Brewing Company. 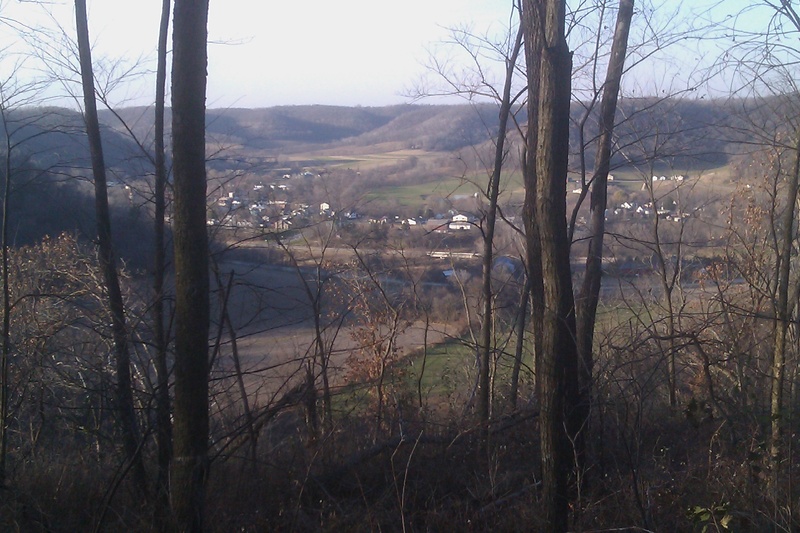 Located 20 minutes Northwest of Winona, MN near the town of Rollingstone, MN is the Olvalde Farm and Brewing Company. It’s owner, brewmaster, packager, distributor, and salesman is Joe Pond and he was kind enough to provide me with some background on Olvalde’s history, his beer, his take on what it means to be a “local brewery”, and what’s in store for Olvalde’s future. Brightbeer (BB): I understand that your beer hit shelves in March of this year, but how long in the making has Olvalde been? BB: What is the significance of the name “Olvalde”? JP: Olvalde is the brewer for the Frost Giant King, Thrym in the Norse mythology. There are many alternate spellings. BB: How have your experiences working at commercial breweries, Goose Island and at Summit, prepared you to start your own brewery? JP: [I was a] brewer at Summit and Process Engineer/Brewer at Goose Island. I had the opportunity to be a brewer on a day to day basis and make a lot of great beer. At Goose Island, I not only worked as a brewer, but did daily work in the lab and worked on process improvements. Really, it gave me practice applying my Chemical Engineering education to brewing. BB: I understand that you plan to become a “closed loop brewery” essentially being a completely estate brewery requiring basically no outside resources and recycling your own waste back into the process or farm, can you speak to that? JP: That’s the (long term) plan. I’m working now on test malting some barley that we’ve grown on our land. We are also building up our garden of traditional English and gruit herbs. So hopefully in a few years we’ll have at least a seasonal that is entirely made from our own grains and herbs. Solid waste from the brewery is currently composted on the farm or fed to local cows; as I get down there more often, we’ll add a few of our own animals to do the eating. We plan on starting to land-spread our liquid waste on the fields next year: the wastewater is rich in nitrogen and phosphorus and helps offset any fertilizer requirements. Of course there are limits, I don’t plan on blowing any glass. I view beer as an agricultural product that should reflect the environment it was brewed in. As a farmhouse brewery, I really want to take advantage of the water, land, and seasons. BB: What are your thoughts on the craft beer movement overall, and within Minnesota? How do you see yourself fitting into that movement? JP: The more beer variety the merrier, and we’re getting there. My only concern is the urban brewery development: many microbreweries seem to endorse the German industrial brewing process where the brewing is well removed from the land and everyone is happy to ship in homogenized ingredients from the far reaches of the globe. I like the idea that local beer, like local food, should reflect the local resources. We have cold winters for lager fermentations, hot summers for ale fermentations, great water, and great farmland for grains and herbs, great white oak for casks, etc… When I hear Minnesota Beer, I want to think beer of Minnesota, not German or English Style beer brewed in Minnesota. BB: I have read descriptions about your beer, The Auroch’s Horn, and had it myself several times, but how would you explain it to someone who has never heard of it or maybe doesn’t know much about beer? JP: That’s a tough one. Anyone who’s visited me at a tasting event has heard ‘A strong golden ale I brew with a little wheat and a lot of honey’. I focus on the grain, honey, and fermentation to get a sapid (palatable) ale full of fruit and spice flavors. The combination was inspired by The Barbarian’s Beverage, by Max Nelson: He wrote that Roman historians frequently cited a strong fermented beverage common to the barbarians of Gaul, Brittania, and Germania made from barley, wheat, and honey. BB: What are your plans for the brewery in the near future? New offerings? Any amount of expansion or development for accommodating tours? JP: I plan on putting out 3-4 seasonals a year. I’ll have another this November. I do not currently offer tours (I’m not there often and when I am I’m generally brewing or bottling). I would like to offer some kind of tours in the future, but have some hoops to jump through first. BB: What food pairings do you especially enjoy with the Auroch’s Horn? JP: I originally had The Auroch’s Horn pegged as a spring seasonal, and thus had brook trout and spring vegetables in mind while putting the recipe together. I definitely recommend fish poached in The Auroch’s Horn, and the liquid with some extra honey makes a nice glaze. Also goes great with spicy, fruity stews: chicken braised with citrus fruits and spices like cinnamon, turmeric, and ginger. BB: Do you communicate with other local brewers/owners regularly? JP: Not really, I tend to keep to myself. I plan on doing more but right now, with the brewery, 3 girls, and twins on the way, I’m pretty busy at work/home. BB: Last one for fun: What beer or beer style are you enjoying at the moment? JP: I’m a seasonal drinker, so I’m drinking Oktoberfest at the moment. As you can tell, Joe’s focus is on taking his time to ensure that he can put out quality beers while keeping his brewing process and ingredients very locally sourced. The mission at Olvalde (along with the beer, which we’ll get to in a second) is very inspiring. As a young craft beer lover and someone who is excited about eating, drinking, really living based on their immediate locale, Joe Pond is setting a great example. He exemplifies what it means to drink local and relish in the terroir (local flavor) of the wonderful geography we have here in the Upper Midwest. But enough of the background, what is the beer like? Overall: Beautiful initial aromas to let you know that this is a farmhouse ale with Belgian yeast and German Hefe-weizen aromas but a present and enjoyable amount of honey. The taste is very well balanced not allowing the banana/clove, caramel, or honey flavors to dominate, instead they work together in layers. It is really a joy to drink, everything about the beer is pleasant and even if you are not a beer lover (or even liker) I think this beer would suit your palate. Follow Joe’s suggested food pairings or drink it alone, either way you will surely enjoy this beer. I want to thank Joe Pond for taking the time to answer my questions so thoughtfully and for all of the hard work he is putting into his brewery and for leading the way for other locally produced craft beers. I hope that you enjoyed learning about one of Minnesota’s newest, smallest, and truly local craft breweries. 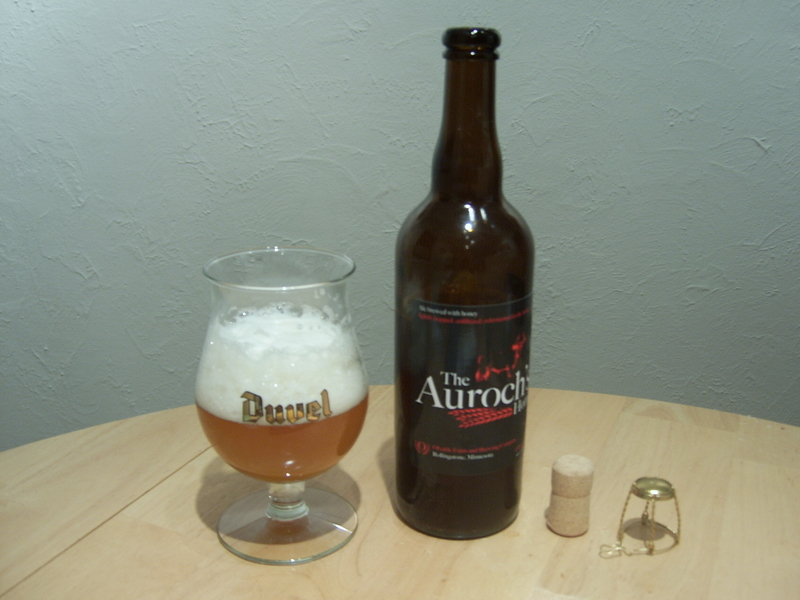 If you want to find out where you can purchase The Auroch’s Horn (currently only available in 750ml/23.9oz hand corked and caged bottles) look here. I am excited to bring attention to high quality and locally crafted beers and their brewers because end it benefits everyone in the area. There will be more brewery features and interviews to come in The Local Mash series. Looking ahead to next week: It’s hop harvest time folks! This means that “fresh” or “wet” hopped beers are out. I’ll give a rundown of whatever I can get my hands on and let you know what all the fuss is about. In the mean time try to track down some fresh/wet hopped beers on your own at local beer stores or brewpubs. Till next Thursday, drink well! Cheers! Posted in The Local Mash and tagged brewery, craft beer, Joe Pond, local, minnesota, olvalde, The Auroch's Horn, The Local Mash, twin cities. Bookmark the permalink. Great interview and review of Olvalde! Very interesting even to a wine drinker keeep it up.